The Salzburg Cube or as it is also know the Wolfsegg Iron is a strange ancient artifact found back in the last 19th century in Austria. The Salzburg Cube caused intrigue and revelation when it was first found in Wolfsegg am Hausruck which is located in Upper Austria. A true ancient artifact, The Salzburg Cube is often mentioned as an out of place artifact, describing how its location of origin does not match its makeup. Because of this The Salzburg Cube still continues to interest historians, conspiracy theorists and scientists to this day. On first appearance the Salzburg Cube doesn’t really look like a cube, and here in fact the name Wolfsegg Iron is probably a better fit. The Cube itself is more like a rounded object with two two flat edges, down the middle the Salzburg Cube has a groove that gives the artifact its most defining feature. In addition the Iron has a multitude of pits and craters that cover its entire surface, including the central groove. It’s easy to see why the interest in the Salzburg Cube originated. Is features and looks with the groove and pits make the Iron look of otherworldly origin. The colouring of the iron itself also adds to the potentially futuristic style, and it would not look out of place in a science fiction movie. The name of the Salzburg Cube comes from its location, as it was held at the Salzburg Museum but then mysteriously disappeared in the early 1900’s under apparently mysterious circumstances, only to later re-appear at the Heimathaus Museum. The Cube part obviously comes from the shape of the artifact, but as is quite visible in the photo, its not really cube shaped. The name of the Wolfsegg Iron of course refers to the location the ancient artifact was found, and being that the artifict is in fact made of Iron it wholly possible for you to work out the rest for yourself. Which of these names is more relevant is quite interesting, I believe the Wolfsegg Iron has a much more descriptive way about it, being the original location and also describing the material in a better manner than the Salzburg Cube does with the shape. Either way, both names have stuck and this ancient artifact from Austria is commonly referred to under both terms. The Cube itself was found on what has both been referred to as a mine, and also as an iron foundry. I believe the reasons for this are clear, the Salzburg Cube itself was dug out of a coal mine located in Wolfsegg am Hausruck in the state of Vocklabruch in Austria, and later the cube was discovered in an iron foundry by one of the workers there. This is where the story of the Salzburg cube really gets interesting, the miner who found the cube at the iron foundry, was apparently breaking open a piece of coal and found the Cube inside. It is believed that the strain of coal the cube came from and that was dug out of the mine was dated back as over 60 million years old. 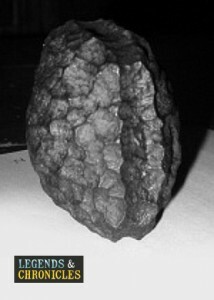 Once the cube had been found, its reported that the manager on site of the foundry took the artifact to the Heimathaus museum. One of the initial analyses of the Salzburg Cube was done by a geneology professor from Bonn University in Germany, Adolf Gurit who made an initial observation that the Cube was in fact of meteoric origin. Mr Gurit’s finding would later be cast into doubt when the Natural History Museum in Vienna analysed the Cube using electon beem analysis, and when they found no traces of the common elements attached to meteoric origin like cobalt, nickel or chromium. The Salzburg Cube fact or fiction? Of course, there have been plenty of theories and scientific research done on the Salzburg cube and it’s hard to argue early analysis with more modern science. The intial theories of the cube being from a meteor or outer space where later replaced with more pure science where the cube was thought to be man made and manufactured. While some mystery may remain about the Cube, the loaction of it is currently unkonwn, just adding another layer of mystery to the puzzle. Has the Salzburg Cube been bought by a private collection or simply been destroyed as a worthless hoax, a mere embarrasment to those attached to it? Of course it’s impossible to say, and until we know for sure we can never make a conclusion about the Wolfsegg Iron. Of course, while the cube was on show at the Oberosterreichisches Landesmuseum in Linz, but only until 1958, when it was transferred the Natural History Museum of Vienna for analysis. Before it left the Landes Museum they did make a cast of the Cube. The Salzburge Cube is truly a unique ancient artifact and it’s story and history make it something of intruege. The fact that the true story of the Cube still remains a mystery, and that the current location of the Cube is unknown only adds more to the story. Will the true mystery of the artifact known as the Salzburg Cube and the Wolfsegg Iron ever be uncovered? I Guess we will just have to wait and see.